Faculty of Computer Science, TU Dublin. 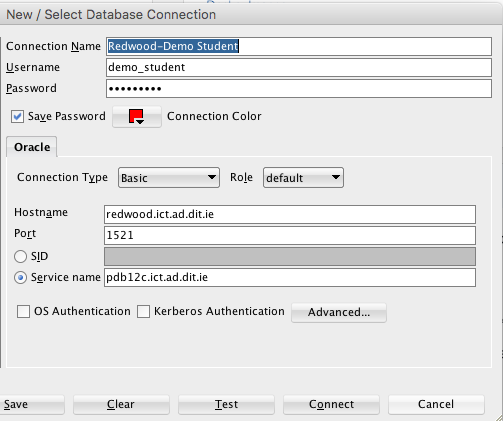 Here are the details for connecting to the Oracle Database Server in the School of Computing. NOTE: this Database Server is only available when you are connected to the DIT network, via direct network connection, wifi or VPN. Students will be assigned a schema/user name and password by their lecturer. This will be given to the student in class. NB: These same details can be used to setup a ODBC/JDBC etc connection your schema in the database. NB: Usernames and passwords are case sensitive. SQL Developer is the client software you need to use to access the database and run your SQL code. This is a free tool and needs to be downloaded and unzipped on your laptop/desktop. There is no install. Just unzip and it is ready to use. SQL Developer is installed on all lab PCs. To download SQL Developer go to the Download Page. Click on the ‘Accept License’ radio button. 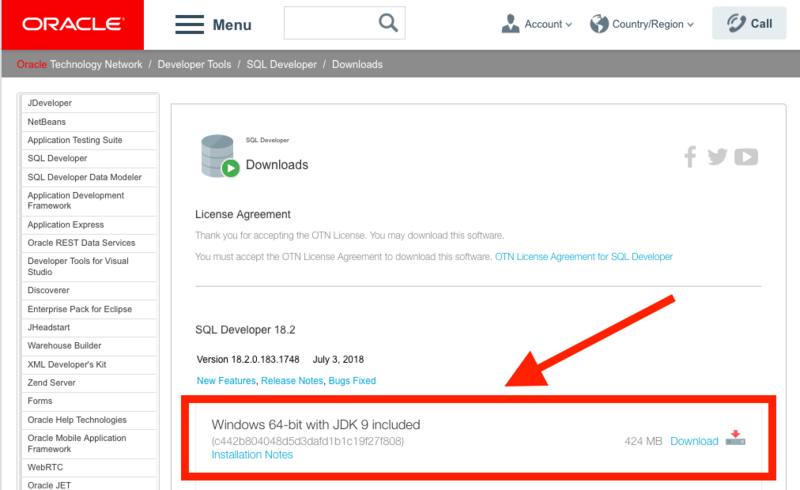 Then download the version of SQL Developer that has the JDK built into it. After downloading the file, unzip it. More details about the tool can be found on the SQL Developer webpage. After starting SQL Developer, you will need to create a connection to the database. A Connections window will open. Click on the Test button to see if you have entered the details correctly. If you get an error, then you have not entered the details correctly. Click the Save button to save the connection details. Check out links to SQL and PL/SQL tutorials.